Families can have more excitement in the 12 attractions featuring educational and technology-rich activities such as making a gingerbread man in Cooking with Gingy, creating one’s own 3-D animation in Dream Studio, experiencing a 4-D animation at the Dream Theatre, joining Kung Fu Panda Dojo and other fun-filled activities. 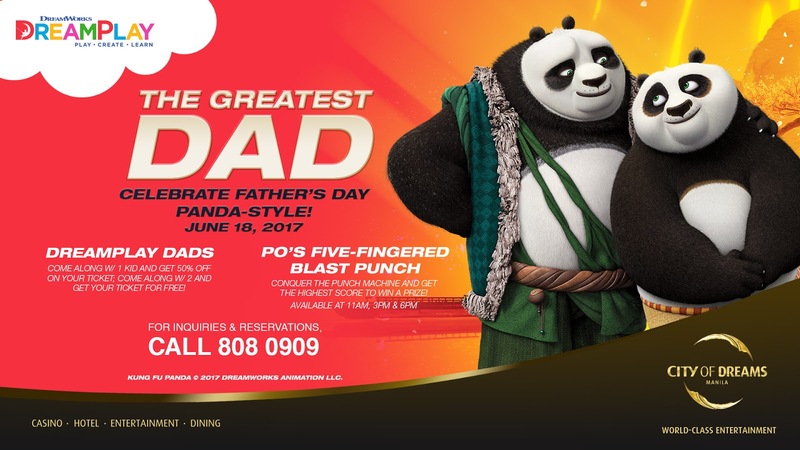 For an unforgettable dad’s day experience, the family can also interact and have a photo opportunity with DreamWorks characters Shrek, Princess Fiona, Kung Fu Panda’s Po, King Julien, Mega Mind and Puss in the Boots. The grown-ups can bond with their dads in a Father’s Day night out replete with lively entertainment at CenterPlay. 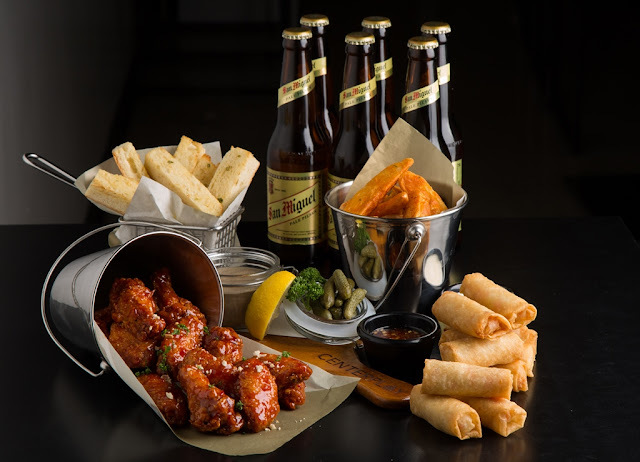 A group of six can avail of the Father’s Day Bucket Deal at P988+, consisting of a bucket of six bottles of ice cold San Miguel Pale Pilsen or Light beer paired with fried chicken wings with sweet and spicy sauce, truffle cream potato wedges, vegetable spring rolls with sweet chili sauce and chicken liver pate with toasted bread and gherkins. At Nobu Manila, the Father’s Day Sunday Buffet Brunch is enhanced with Roasted US Prime Ribeye, Short Ribs Miso Gochujang, Nobu Style Borchetta, Wagyu Beef Takumi Burger, and Truffle Butter Crusted Fresh Baked Oysters. Nobu’s Sunday Brunch is from 11:30 am to 3 pm at P3,880++ per person for the non-alcohol beverage package and an additional P990++ or P1,990++ per person for the standard alcohol and premium champagne beverage packages, respectively. 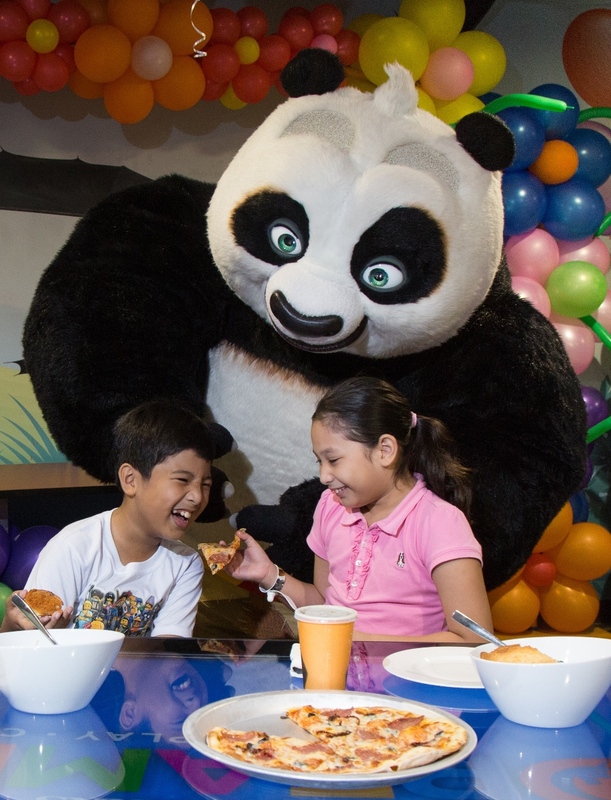 Kids from six to twelve dine at half price while those five and below dine free of charge. 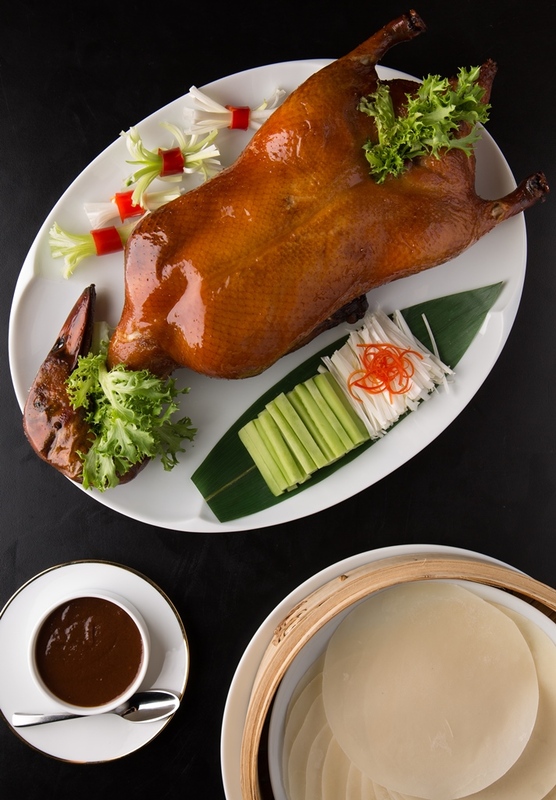 Premium Cantonese and regional Chinese cuisine at Crystal Dragon offers a choice of two sumptuous seven-course menus for Chinese food lovers, or their usual favorites in the a la carte items at Crystal Dragon from June 1 to 18. The Precious Set Menu is for a minimum of five to seven persons and highlights Double Boiled Crocodile Tail Soup with Sea Cucumber and Maca; Crispy Roasted Chicken Hong Kong Style; and Braised Pork Belly with Australian King Brown Mushroom in Clay Pot. The Virtuous Set Menu, which is for a minimum of eight to ten guests, includes: Home-Styled Steamed Cod Fish with Cordyceps Flower; Roasted US Duck in Cantonese Style with Plum Sauce; and Braised 10 Head Abalone with Homemade Spinach Bean Curd. The set menus are both priced at P3,380++ per cover. An a la carte menu with some of these items will also be available during the promotion period. For al fresco dining, families can celebrate Father’s Day with a barbecue buffet at Wave poolside restaurant from 5 to 9 pm. 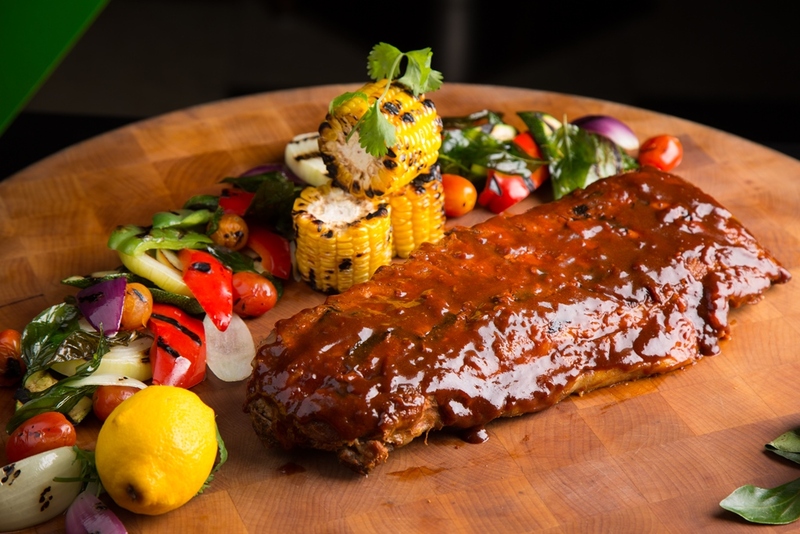 Some of the mouthwatering and freshly-grilled buffet specials are Black Angus beef brisket and eight-hour smoked pork ribs, and Angus beef burgers. A salad bar, specialty breads, pasta choices, cheese display, and desserts including a halo-halo station complete the barbecue experience ideal for the whole family. The Father’s Day barbecue buffet rate is at P1,280++ inclusive of one round of iced tea, soda or fresh juices. Free-flowing local beers may be included for an additional P500++. 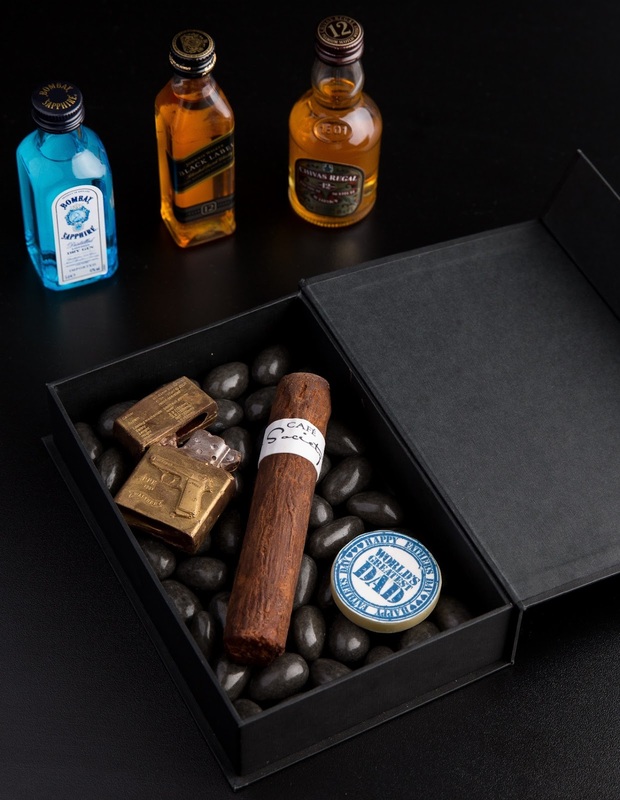 To top it all off, nothing else says “I love you dad” more heartwarmingly than a gift of a relaxing Father’s Day staycation with the entire family at Crown Towers or Nobu Hotel Manila. The weekend staycation, offered from June 16 to 18, includes a Father’s Day gift of mini liquor set and dark chocolate bonbon that is sure to make dad feel truly special. At Crown Towers, dads get the ultimate pampering package as the VIP luxury hotel offers a choice between an overnight or two-night accommodation complete with buffet breakfast at Breezes for two adults and two children five years old and below, F&B dining credit at any of City of Dreams Manila-owned establishments worth Php 3,000 net, and a 60-minute Intensive Muscle Release Massage for two adults at the luxurious Crown Spa. Overnight stay packages start at P17,500 net and a two-night stay for P26,000 net, both for a Resort Room. A modern Japanese-inspired Father’s Day getaway is in store for dads at Nobu Hotel Manila. This staycation package also offers a choice of an overnight or two-night accommodation, with buffet breakfast for two adults and two children five years old and below at Nobu Manila restaurant, F&B dining credit worth Php 3,000 net at any of City of Dreams Manila-owned establishments, a 60-minute Renewal Massage for two adults at Nobu Spa. 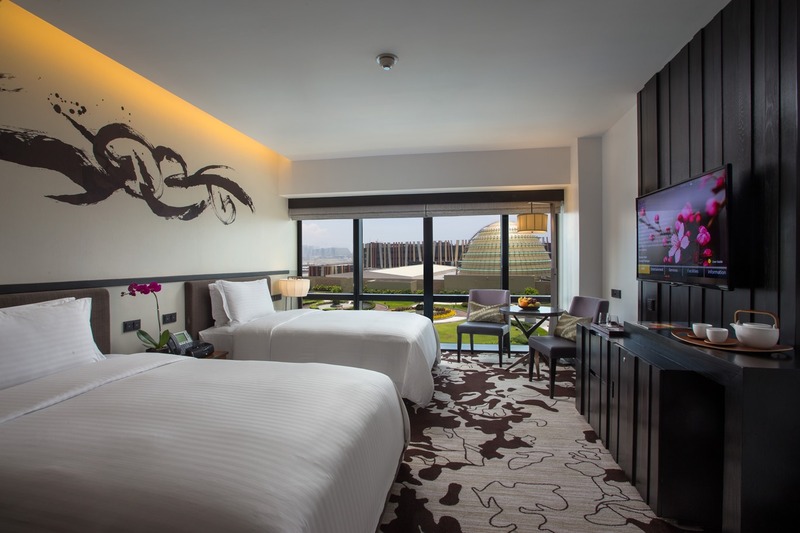 Overnight stay packages range from P14,700 net for a Nobu Deluxe room to P22,700 net for a Nobu Suite. 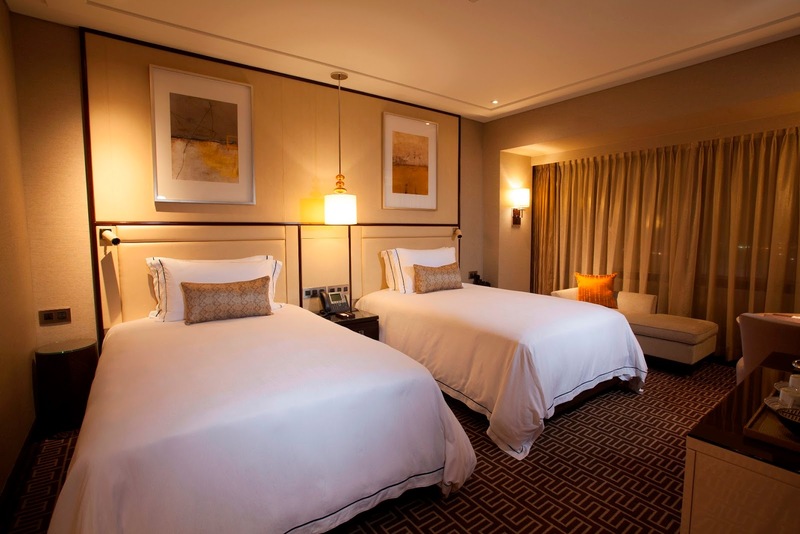 Two-night stays are P21,700 net for Nobu Deluxe up to P37,700 net for Nobu Suite. For inquiries and reservations, interested patrons can call 800 8080 or e-mail guestservices@cod-manila.com. City of Dreams Manila marks the formal entry of Melco Resorts and Entertainment Limited into the fast-growing and dynamic tourism industry in the Philippines. The integrated casino resort at Entertainment City, Manila Bay, Manila, officially opened its doors to the public in February 2015 and is operated by Melco Resort and Entertainment (Philippines) Corporation (“MRP”). Located on a 6.2 hectare site, the integrated resort complex brings together a diverse collection of contemporary leisure and lifestyle brands including Crown, Nobu, Hyatt and DreamWorks. As such, an exceptional entertainment experience awaits all types of travelers and visitors from around the region. The dynamic and innovative resort complex, located on an approximately 6.2-hectare site at the gateway to Entertainment City, includes the ultimate in entertainment, hotel, retail and dining and lifestyle experiences with aggregated gaming space, including VIP and mass-market gaming facilities with up to approximately 268 gaming tables, 1,652 slot machines and 158 electronic table games. Melco Resorts and Entertainment (Philippines) Corporation, with its shares listed on the Philippine Stock Exchange (PSE: MRP), is a subsidiary of Melco Resorts & Entertainment Limited (NASDAQ: MLCO). It has developed City of Dreams Manila, a casino, hotel, retail and entertainment integrated resort, which has three luxury hotels each with two towers, numerous specialty restaurants and bars, gaming and retail facilities, exciting entertainment venues including a family entertainment center, and a multi-level car park.